The entrance to Didcot Railway Centre is through the ticket hall and subway of Didcot Parkway railway station - Didcot, Oxfordshire, OX11 7NJ. A new 1800 car Multistorey Car Park has recently been opened in the old Foxhall Road GWR/APCOA car park area. This car park is a little way from the Railway Centre, involving a long walk over the new covered bridge. The bridge does however have lift and ramped access so is fully accessible, but signage at the new car park is, as yet, rather sparse, for which we apologise. If you do use this car park please, once you have paid, exit the car park at footbridge level (level 2), cross over the railway and the path will lead towards Didcot Parkway station from where you will see the signs for us via the station ticket hall and subway. If you park in the main station car park, note that it is usually cheaper to pay using your mobile phone than to pay the advertised fee by cash or credit card. Also any special offer which may be in force for parking will normally only apply through this route. See the APCOA website for more details. 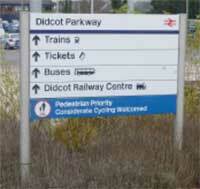 Alternative, more convenient and often cheaper, parking is usually available at weekends opposite the station. There are two car parks here, one on either side of the Prince of Wales public house. Follow the signs to the Railway Station to find these car parks. Note that Julians car park only accepts payment via Mobile Phone using Ringo. If you are using the main car park you may find it convenient for passengers to disembark at the station entrance before the driver parks the car. A parking fee may be payable at any of these car parks which are all independent of the Railway Centre. 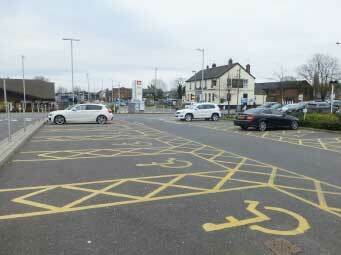 Some parking for those with Disabled Parking badges is normally available near the station entrance. More information about accessibility is available. Please be aware that some of the companies which run the various car parks are very enthusiastic about fining people who do not park properly within the marked bays!